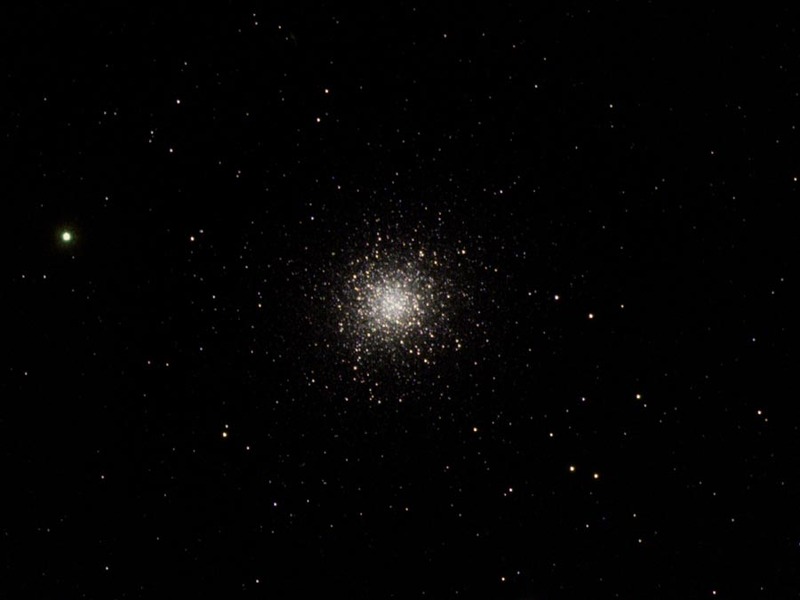 The great globular cluster, M13 is located high overhead for observers in the northern hemisphere during the summer, allowing for excellent viewing. When observing this cluster back in 1977 with my 4 1/4-inch f/10 reflector, the most I could see was a moderately bright ball of unresolved stars. While observing M13 with the small reflector, I was unaware of the three dark lanes cutting into the SE edge of the cluster, called the propeller. I had never heard of the propeller at that time, but this scope was far too small to see this very faint feature. However, thirty two years later, in May of 2009 using a much larger telescope, I would see the propeller. A 10-inch telescope might be considered the minimum aperture required to see this most unique feature. If you have plans to observe the “elusive propeller” a magnification of around 200x seems to be the optimum magnification. The propeller challenge seemingly became popular due to Walter Scott Houston, columnist and writer of “Deep-Sky Wonders” suggesting that observers look for it. Houston first wrote about the propeller in the July 1953 edition of Sky & Telescope magazine. He brought it up several more times through the years, however, it has been only in recent times that the propeller has gained much attention in the amateur astronomy community. Lord Rosse mentioned three dark rifts in the 1850’s, and T.W. Webb in “Celestial Objects for Common Telescopes” noted that the lanes were seen by Buffham, using a 9-inch reflector. In May of 2009, I was able to observe the propeller with both a 10 and 12-inch reflector. 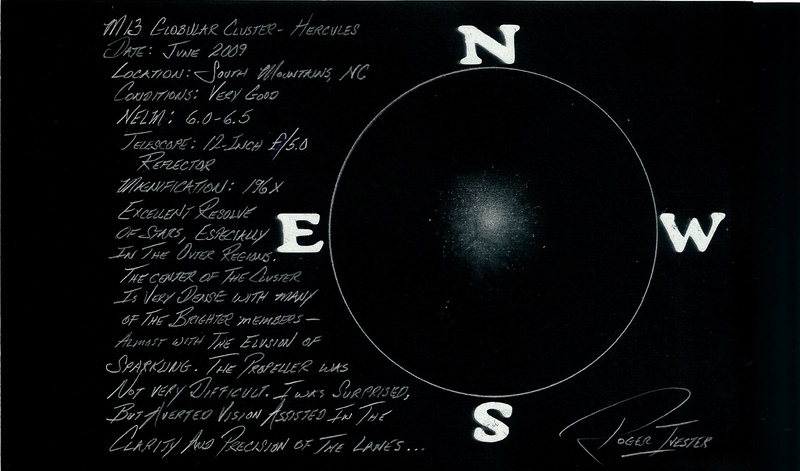 My observation of the cluster with the 12-inch came from the southern rim of the South Mountains in North Carolina. I would rate this site as very good with a NELM of 6.5, and maybe even better on an excellent night. The propeller was fairly easy to see with the 12-inch f/5 reflector from a dark site. Seeing the propeller, however, proved very difficult using a 10-inch f/4.5 reflector from my moderately light polluted backyard with a NELM of 5.0 or slightly less. Fred Rayworth and Ryan Rogers of Las Vegas were able to see the propeller fairly easily, using a 16-inch reflector with a magnification of 203x. The following sketch was made using a 12-inch f/5 reflector at 190x from the southern rim of the South Mountains in western North Carolina. The sketch was made with a No. 2 pencil and a blank 5 x 8 note card. The colors were inverted using a scanner. The following image was taken by Dr. James Dire of Hawaii, using a 190 mm Orion Maksutov-Newtonian. This entry was posted on June 23, 2012 at 5:53 pm and is filed under Work File Only - Observer's Challenge Reports. You can subscribe via RSS 2.0 feed to this post's comments. Both comments and pings are currently closed.